Dear Siddhant and Manvir.. Where should I start from.. I can't really find one word to appreciate your efforts and dedication as saying "Perfect" would be under estimating your efforts... Your never say no attitude, great positive energy and quality of service really impressed all of us. I will always be grateful for making my parents 50th Anniversary the most magical days of my life. You guys are just amazing people one ever meets in lifetime. Thank you so much for putting in extra love, care and happiness... Everyone felt it!! A massive thank you to Shanqh team.. You guys rock!! They are just spot on. I think if they are not, they will be best wedding planners and designers in India in the coming year. Thanks guys, we enjoyed working with you! They always looked confident, the team is very polished and we could not have asked for more. They have a bright future and our event was planned and organised so well. Could have been better ideas, execution & planning ! The planning looked like a cakewalk with these guys on board. Thanks for giving me and Rahul a dream wedding. Cannot commend your polite staff and high skills of management. Couldnt have been better. Cheers guys!! The most energetic team we have worked with. Honestly, we have had so many weddings in the family but the way Shanqh has involved with our family members and the politeness and patience has been amazing. Thanks for making our amazing wedding!!! They were very professional and very quick in organising everything we wanted. We hired at the last moment as the marriage got fixed last moment but we never felt we had to do anything, everything was handled by them superbly. Thanks Team Shanqh for planning our grand day. Your designs have become a talk of the town in Ludhiana. These guys ruined the most important day of my life. Please don't hire them unless you have 1crore to spend on your wedding. They took advantage of the fact that I live in USA and kept making fake promises and pushed everything to last minute. They are extremely unorganized and only pay attention to high profile clients. It was the worst decision to hire them. Met Siddhant and Manvir at a friends wedding and ever since have called them for all our family functions and they are a must recommend to everyone looking out for a planner or a decorator. They are an energetic group of people who have really innovative ideas!! Guys you will shoot the stars, 5/5 for you. Thanks Team Shanqh for designing and planning our destination event to every detail. We proudly recommend you to everyone! The Umrao wedding was excellent. It was a pleasure working with you ! You people have always been very responsive and made our family feel very comfortable speaking to you . Thanks Team Shanqh for having our dream wedding possible. There were positive vibes from the first meeting we had at home and I salute your creative minds and the effort in shaping things as wanted though I know we ate your head. There is something in these guys that we get all our events done through them. They understood our taste in the first meeting and ever since we have left all our family weddings, anniversaries etc on them. All the best to Team Shanqh!! They create very unique Decor and specially they since we had a constraint on the budget, they took time in developing our themes but brought up great stuff. We chose them in the first go! Best Event Planners, their energy is too high and it always feels they put their skin on even the smallest thing. They will go a long way, All the best Manvir and Siddhant!! Cant say much about you guys other than 'You guys are fabulous', all our guests were extremely happy with the the way RSVP's and Guest Management was given personal attention. We are looking forward to working with you again!! Their hunger for work and delivery is outstanding. We have been utterly dependent on them for our Jaipur destination wedding and they had left no stone unturned to make it a huge success. If you have a wedding, reach out to them without a thought!! 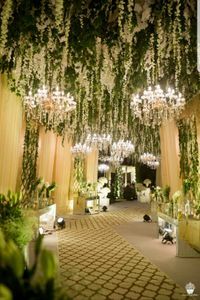 Really no doubts about their commitment and delivery unlike a lot of other event planners we came across, they deliver more than the promise. Got everything done from them and they always came up with flying colours. These guys are superb at their work and they planned our destination wedding at Jaipur flawlessly. They add special moments to the events which make it memorable. Must recommend them to everyone!! The experience of working with the Shanqh Team is amazing. The energy these guys have is rocking!! Amazing Dcor concepts by Designer Siddhant and Event Management, our every guest was truly taken care of. They are the best event planners around. The options they had and the way they plan a wedding is way ahead of competition. Their communication with us was top notch. Our planned destination wedding in Jaipur in Shiv Vilas and Fairmont was one of the best. I've seen the personal dedication put in by the team specially personal involvement of Siddhant and Manvir for making things flow so smoothly and seamlessly. Loved their work and planning. Excellent Event Planners!!! Very warm and their suggestions are very professional..
Shanqh gives you the best of everything. All our guests were enthralled by the flawless work done by the Shanqh team. Whole of the team had put their heart and soul to make the event a dream come true. The event was a talking point for a long time even after it was concluded for its flawless execution. Well done guys! Sidhant and his team are exceptionally talented and equally particular about execution. Overall good service and great team! Would recommend to all my friends and family. Innovative ideation. Excellent display of results. Beautiful ideations. Perfect execution. Loved their work.